Per tale motivo, la Comunità Interspecifica Ondamica ha diffuso un messaggio agli omeopati: una lettera aperta da parte del POPOLO DEL TRAUMA, corredata dal famoso e illuminante passaggio del filosofo tedesco Max Horkheimer che descrive la struttura gerarchica del presente («Il grattacielo», da Crepuscolo. Appunti presi in Germania 1926 ‐1931, Einaudi 1977). 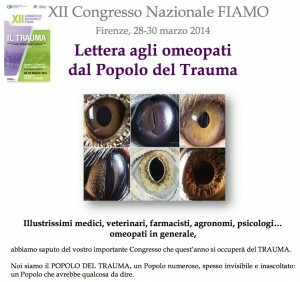 This year the 12th ” FIAMO National Congress” (Italian Federation of homeopathic practitioners and associations), focused on the theme of TRAUMA. If we consider the broad and extensive view that Homeopathic medicine practices and supports, we cannot ignore the planetary and systematic trauma that the human being repeatedly inflicts upon non-human animals. For this reason, the Interspecific “Ondamica” Community issued a message to homeopaths: an open letter from the people of TRAUMA, accompanied by the famous and enlightening passage of German philosopher Max Horkheimer, who describes the hierarchical structure of the present (“the skyscraper”, from Dawn : Notes taken in 1926-1931 Germany). A cross section of today’s social structure would have to show the following: At the top, the feuding tycoons of the various capitalist power constellations. Below them, the lesser magnates, the large landowners and the entire staff of important co-workers. Below that, and in various layers, the large numbers of professionals, smaller employees, political stooges, the military and the professors, the engineers and heads of office down to the typists. And even further down what is left of the independent, small existences, craftsmen, grocers, farmers e tutti quanti, then the proletarian, from the most highly paid, skilled workers down to the unskilled and the permanently unemployed, the poor, the aged and the sick. It is only below these that we encounter the actual foundation of misery on which this structure rises, for up to now we have been talking only of the highly developed capitalist countries whose entire existence is based on the horrible exploitation apparatus at work in the partly or wholly colonial territories, i.e., in the far larger part of the world. Extended regions in the Balkans are torture chambers, the mass misery in India, China, Africa boggles the mind. 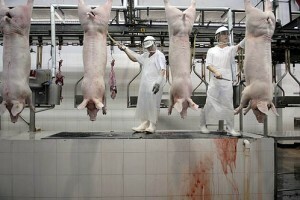 Below the spaces where the coolies of the earth perish by the millions, the indescribable, unimaginable suffering of the animals, the animal hell in human society, would have to be depicted, the sweat, blood, despair of the animals. We hear a great deal these days about the `intuition of essence`. Anyone who once “intuited” the “essence” of the skyscraper on whose highest floor our philosophers are allowed to pursue their discussion will no longer be sursprised that they know so little about the real height at which they find themselves, and that they always talk only about an imaginary one. Such a person knows, and they may suspect, that otherwise they might become dizzy. He is no longer surprised that they would rather set up a system of values than one of disvalues, that they rather talk about “man in general” than about the concrete individual, about being generally rather than their own. For if they did, they might be punished by being sent to a lower floor. The observer will no longer be surprised that they prattle about the “eternal” for as does the mortar, that prattle holds together this house of present-day mankind.The basement of that house is a slaughterhouse, its roof a cathedral, but from the windows of the upper floors, it affords a really beautiful view of the starry heavens.